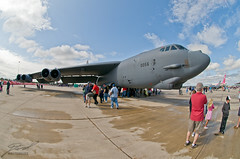 One of the cooler planes on display at the 2009 Selfridge Air Show was a Boeing B-52H Stratofortress but it really didn't present well for photos (it was really facing the wrong way for the sun and there were alway people walking in the bomb bay and wheel wells). So when the fisheye came out I tried one with that. The Stratofortress looked much different this way.